Since 1967 – Siegi Tours has been organizing special school ski & snowboard holidays for international schools and youth clubs in the heart of the Austrian Alps. We are looking forward to sharing the special Siegi Tours Experience with you and your school group! Cosy typical Austrian 3 star school accommodation including the room with shower/Wc, breakfast and dinner with salad buffet and a great choice of delicious menus. 5 days of ski / snowboard / cross-country instruction or guiding (4 hours per day) at the Siegi Tours Ski & Board School Red-White-Red. Our certified, English speaking ski & snowboard instructors are highly qualified when it comes to teaching school kids, teens and children in general. The week will be filled with fun, adventure, motivation, great group experiences and challenges. But be assured that safety comes always first. At the end of the week the kids can show what they have learned and try to win the trophies at the big race. This event is followed by the presentation and celebration party. Don’t miss the close by thermal world Alpen Therme Bad Hofgastein as it offers many indoor and outdoor swimming facilities, a leisure and wellness center including different types of saunas. Game Area with playstation, darts and the newest action sports and funny home videos. Don’t worry, you won’t miss the major sport events either! Additionally to the regular Siegi Tours Sport Week the students have to do homework after the ski & snowboard classes. Additionally to the regular Siegi Tours Sport Week the students have a culture program prepared at school with their teachers before they come to St. Veit. The culture program varies depending on the teachers requests. Since 1967 Siegi Tours provides high safety standards. The safety of our customers and staff is a top priority for us and we do our best to ensure that your school ski trip to Siegi Tours goes smooth and trouble-free. We are pleased to offer as much assistance and reassurance as possible in the planning of your school ski trip to Austria. The Siegi Tours School Safety Management System will take care of all reasonable steps to ensure that every controllable aspect of the trip is planned. We are happy to offer you two nights of free accommodation (bed and breakfast) for two people in the Siegi Tours Hotel Rustica. Transport arrangements are not included. We will arrange meetings with the hotel owner, all the relevant people of the ski resort and the ski school for you. Siegi Tours guarantees that it complies with the requirements for inclusive tours as defined in the Package Travel, Package Holidays and Package Tours Regulations Act 1992. We can offer you also a travel insurance. 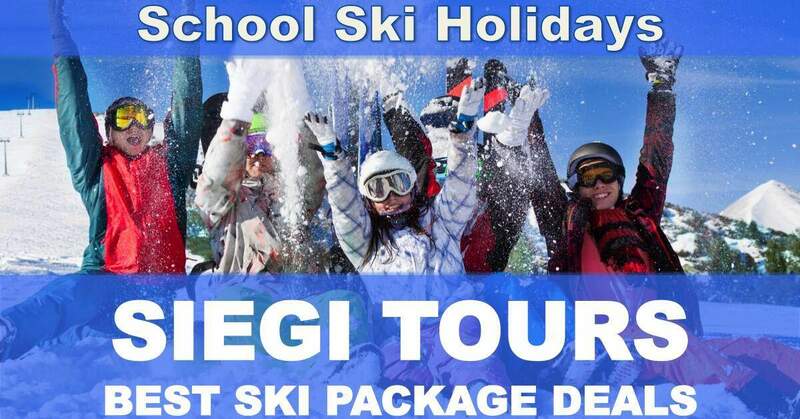 Ask for special Siegi Tours rates according to your individual School Ski Packages. The Siegi Tours Team will be happy to visit you and your group / school in your area with a Siegi Tours Presentation. If you are interested please contact the Siegi Tours office for further information. We also work together with International Schools who organize a mixed trip, so students, teachers and their families come as a group. Ask for special Siegi Tours rates according to your individual School Packages.